Finding a spot on a frozen lake or reservoir and setting up shop to catch some fish is a great way to spend free time in the winter months. Ice fishing is fun and rewarding, but also presents dangers you need to be aware of, so you can stay safe. When you go out on the ice, you put yourself at risk for suffering frostbite, hypothermia, drowning or even carbon monoxide poisoning. Some simple planning ahead of time can help you mitigate these risks. Here are some ice fishing safety tips to use in your next trip so you can have a fun time catching fish instead of ending up in the local hospital. One major mistake you can make when ice fishing is to venture out on the ice alone without telling anyone where you’re going. If you plunge through the ice, slip and fall and seriously injure yourself, or have your vehicle break down on an isolated road, getting rescued will be extremely difficult if no one knows where you are. Always make your plans known to family and friends. Tell them when you plan to leave, where you are going and when you plan to return. This way, if something does happen to you, they know where to send help. Fish with family or friends whenever possible. You should never fish alone if you don’t have to. Accidents can and do happen, even to a person who is seasoned in the outdoors. It isn’t worth the risk just to get some solitude or avoid revealing your secret fishing spot. Always check on current weather conditions before heading out. Consulting with a local tackle shop is your best option here. They are familiar with the area and can provide a reasonably accurate fishing report and give you a lead on where it is safe to fish. Bring a cell phone and a two-way radio with you. The radio should help cover you in areas where you can’t get cell service as readily. Having both options gives you a way to communicate with the outside world in case you run into trouble, so someone can send help right away. Any delay in getting rescue can prove deadly in some situations. The worst thing that can happen to an ice fisherman is falling through the ice. If you have your doubts, take look at these statistics from the Minnesota DNR. Most deaths while ice fishing occur from breaking through the ice while on a snowmobile, ATV, or motor vehicle. The best thing you can do is to learn how to read and assess the quality of the ice before going onto the lake. Here are some guideline for various ice thicknesses. 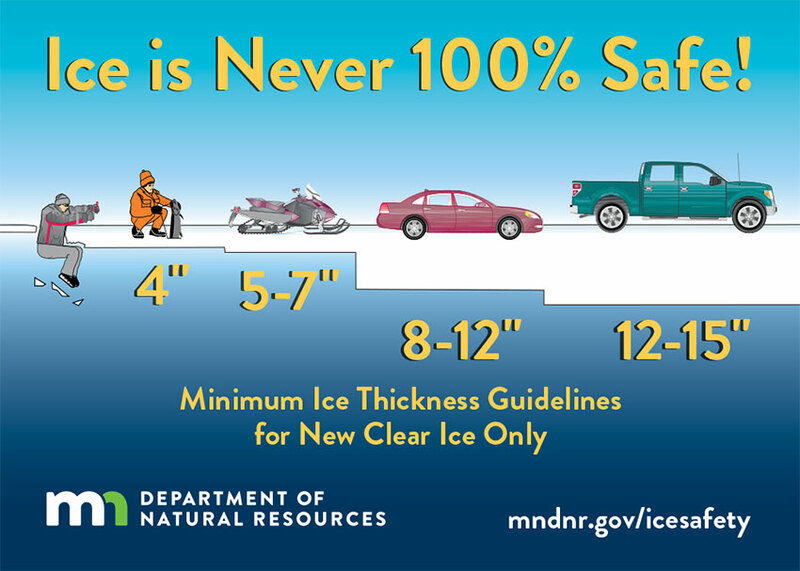 Note that these are just guidelines, as put out by the Minnesota DNR, and the final judgement as to whether the ice is safe, is you. Never venture onto the ice without knowing the conditions. Less than 3″ – Don’t do it! 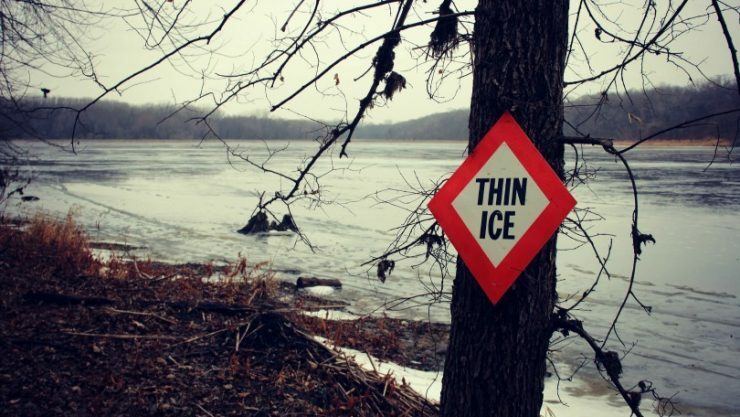 Never venture onto ice that is three inches or less in thickness. It isn’t strong enough to support an average person’s weight. There is a considerable risk of breaking through on foot. 4″ – If ice is at least four inches thick, and not otherwise cracked, it is generally safe for walking. 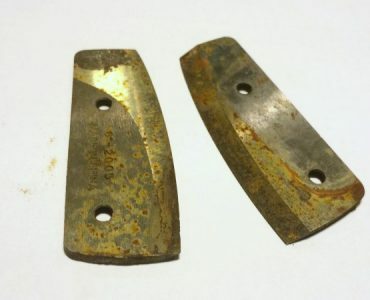 5″ – Generally safe for riding on the ice with an ATV or snowmobile. 8″ to 12″ – Can generally support the weight of a small car. 12″ to 15″ – Typically strong enough to support the weight of a small pickup truck. Be aware of where the current is running. Rivers, streams, inlets, outlets and channels always have weaker ice than deeper waters in a lake or reservoir because of the moving water underneath the ice. Typically, ice will be 15 percent weaker in areas with a constant flow of water than in areas where it is more stationary. Never completely trust the ice even if it is sufficiently thick to support your body weight and your vehicle weight. Always check your surroundings and avoid any areas where cracked ice is visible or currents underneath the ice may be present. Under most conditions, driving on the ice isn’t a good option because thickness isn’t uniform across its surface. Ice may be strong enough to support a vehicle’s weight in some spots, but not in others. If driving is essential to get to your preferred fishing spot, there are a few things you should do to make sure you and your vehicle both stay safe. Use the smallest vehicle possible to get to your destination. Lighter vehicles like an ATV or snowmobile put much less stress on the ice than a car or a truck. Drive slow and keep a safe distance between vehicles. Unbuckle your seat belt and roll down your windows, so you have an escape path if your vehicle does fall through the ice. Avoid driving onto the ice at night. Even with the aid of bright headlights, it is much more difficult to spot areas where the ice is thin, cracked or slushy. You could drive past your turn off, and then it’s too late. Never drive (or walk) in areas where slush can be found within the immediate vicinity. That’s a clear sign of deteriorating ice. Such ice poses a danger because it will not properly support body weight or vehicle weight. 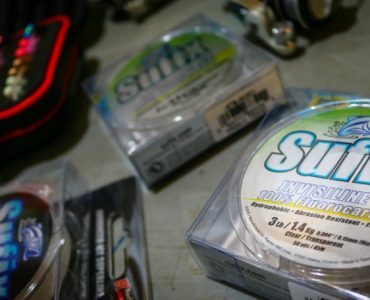 Your favorite rod and reel aren’t the only things you should worry about packing along before hitting the ice. Part of staying safe means bringing the right gear with you on your fishing trip. 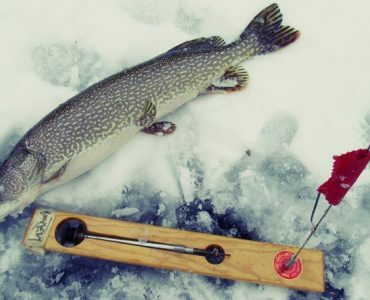 From first-aid kit, to warm clothing, ice shelter, and portable heaters, there are some essential items you need to mark off on your ice fishing checklist before heading out the door. Dressing in the right clothing is important. You should wear a thick coat, insulated pants, thick socks and gloves and a protective cap that can cover your ears or face. This will help protect from frostbite and hypothermia. Always wear thick boots with deep tread designed for better gripping on icy surfaces. This will help prevent slip and fall accidents while walking on the ice. Tackle Scout is an online resource for anglers and boaters looking to catch more fish, and get more from their gear. This site is founded and maintained by real anglers, with decades of fishing and boating experience, as well as longtime members of B.A.S.S. and FLW. I like that you took the time to talk about how to fish safely in the winter! One thing that I thought was the most important piece of advice was that you should make sure to let others know about your plan so that they can call for help if you do not return on time. 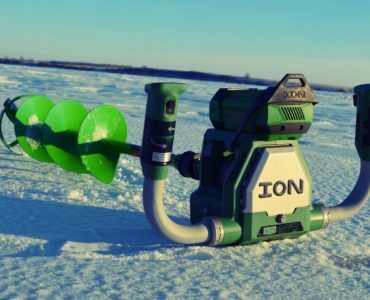 It has always been a dream of ours to go ice fishing in Alaska, and I think that this information would be really beneficial to us. Thanks again, and we will make sure to bring our cell phones, radio, and great company. Tackle Scout is a participant in the Amazon Services LLC Associates Program, an affiliate advertising program designed to provide a means for us to earn fees by linking to Amazon.com and affiliated sites. We also participate in affiliate programs such as Cabela’s through AvantLink.